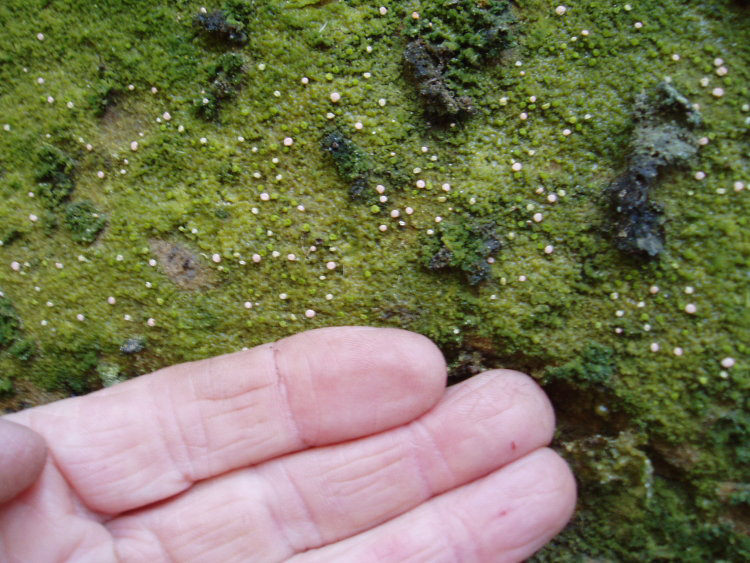 DIAGNOSTIC FEATURES: Greenish-gray primary thallus on rock or compacted sandy soil; almost sessile; flat-topped, pinkish or brownish apothecia; compare with D. baeomyces, which is usually on clay soil, and has definitely stalked apothecia, spherical or ellipsoid. Icmadophila ericetorum is a crustose species which appears similar, but has more typical discoid apothecia and grows on organic material (not recorded from Ohio). ECOLOGY: An Appalachian species that is rare on rocks in mature forests; southeastern in Ohio with records from six counties, on moist sandstone in light shade.